Chess Prime 3D is one of the best designed 3D chess games for the iPad / iPhone. It provides learning support for novice players, a real challenge for the experienced players and fun. Swipe in any of four directions to view the board from any angle and play the chess game in 3D. 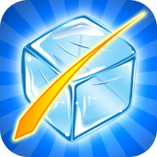 "Cut The Ice Blocks" is a fun and challenging puzzle game with realistic physics. Slice the ice blocks and remove off the screen as much of blue and yellow as possible. Key features: easy controls, 100 addictive and challenging levels, excellent graphics, sounds and music. "Split Up The Balls" is simple but very addicting and challenging game. Test your reaction, tame the angry bouncing balls and make them happy by separating them with moving walls! For all ages, and it is FREE! In this game, your goal is to divide the yellow and blue balls into two groups by the colors of the balls as well as the colors of the play area. "Checkers Prime" is one of the best designed checkers games for the iPad / iPhone. It supports both ‘one player’ and ‘two player’ game play, so you can play against your friends or against a challenging computer opponent. Checkers Prime supports both ‘one player’ and ‘two player’ game play, so you can play against your friends or against a challenging computer opponent. ‘Sudoku: 2 in 1’ is Sudoku that combines both Classic Sudoku game (with numbers) and Colored Sudoku game (instead of numbers, the board is filled with nine different colors). 7000 puzzles, ALL FREE and UNLOCKED! "Chess Prime" is one of the best designed chess games for the iPad / iPhone. It provides learning support for novice players, a real challenge for the experienced players and fun. The 15-puzzle is a popular sliding puzzle that consists of a frame of numbered square tiles in random order with one tile missing. The object of the puzzle is to place the tiles in order by making sliding moves that use the empty space. "Connect All Stars" is a simple and very addictive game. The two players, orange and green, alternately connect stars on the board. If the player connects any two stars and makes the new triangle(s) then the player gets the point(s) and new triangles are colored with player’s color. The goal of the game is to collect more star triangles than your opponent. Develop your own strategy and try to win!